Here are some pictures of my friends doing Wushu, just to give you a better idea what it is supposed to look like. My long time friend, Patrick Lee, demonstrates a front stretch kick. Felicia is performing a scale, a balancing movement. Part of the compulsory Chang Quan routine. 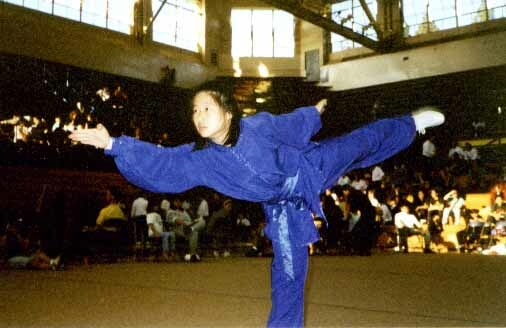 Performed at the 1996 UC Berkeley Chinese Martial Arts Championship. (Note: this is the same photo that appears in the Oct. 1996 Issue of Inside Kung Fu). 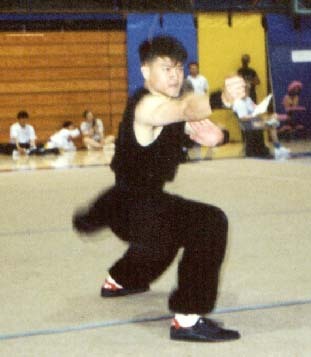 My former roommate, Eric, aka The Southern Fist King performing Nan Quan, Southern Fist Wushu. 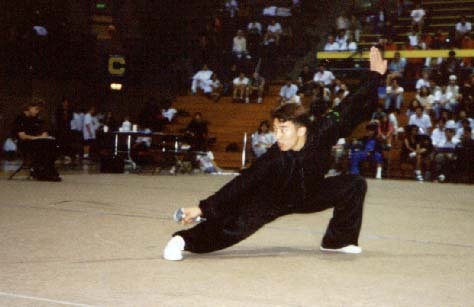 Brandon formerly head instructor of the University of Oregon Wushu Club performing a jumping outside crecent kick at the 1996 US Nationals. Check out how much air he's catching. Brandon formerly of the University of Oregon performing a jump front kick. Gaining major air. 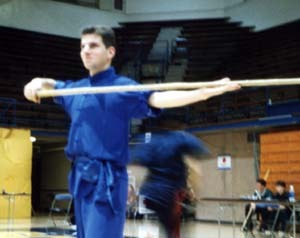 Raffi strikes a pose with his spear before a competition. 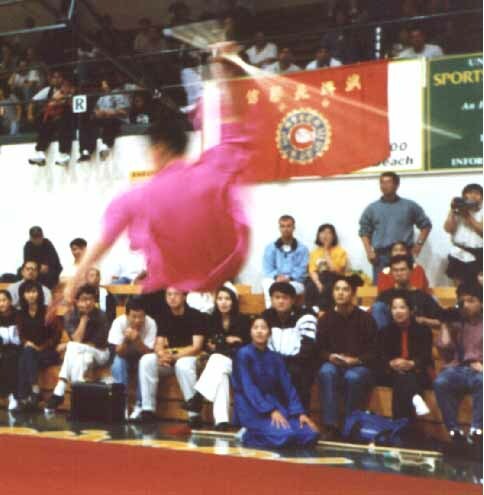 Chan Dae Park, of the Korean Wushu Team, caught in the middle of a jump inside fall during his staff routine at the 1997 Tat Mau Wong Chinese Martial Arts Championship. Notice the stunned onlookers, including Mae Hsu, Dan Wu, Eric Yeh and Anne Hsu. Another shot of Chan Dae Park, of the Korean Wushu Team. This time he is in the middle of a jump inside into horse stance in his broadsword routine. Notice that Mae Hsu is not nearly as stunned this time.